Exotic heritage in this Bungalow in the heart of Clawson! 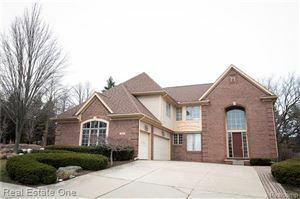 This home has 3 bedrooms and 2 full bathrooms, along with a newly finished basement adding 782 sf of living space. Many updates and quality features including wood floors, new carpet, newer HWH, Pella windows with tinting in the front of the home, new central air, newly updated full bathroom, gutter guards on the home and garage, newer appliances & 6 zone sprinkler system. Also included is the Nest Thermostat, Cat5 Ethernet cabling throughout, LR wired speakers, appliances. Additional bonus is the extra large garage that fits 3 cars, has 220V & a dedicated electrical panel. Enjoy the private backyard made easy for entertaining with hardwired speakers. Easy access to shopping, dining and expressways. Occupancy 30-45 days please. The data relating to real estate properties on this website was last updated as recently as 4/22/19 1:10 AM PDT.